Mazatlán, Mexico, ranks high on my list of favorite fishing towns. In the warm tropical waters of the western Pacific embracing this 500-year-old city in southern Sinaloa, anglers can target an amazing variety of hard-hitting, fun-to-catch sportfish, including three species of marlin, sailfish, mahi mahi, red snappers, groupers, roosterfish, tuna, wahoo, cobia and much more. Mazatlán also has a reputation as a food city, and, for a very reasonable price, many local chefs will turn your fresh catch into something very delicious. That’s one of the reasons I enjoy visiting Mazatlán so much. At one of my favorite seaside seafood restaurants, for example, you can bring in any fish you have caught, from small snappers or mahi mahi to a 100-pound sailfish, and they will be promptly cleaned and cooked to your specifications. When I visit with friends, we usually have the fish grilled and fried, half and half, then served with locally made corn tortillas and all the fixings for tacos de pescado, or fish tacos. The latter include traditional accompaniments such as avocado, cabbage, lettuce, tomatoes, peppers and a symphony of delicious sauces, salsas and pico de gallos. 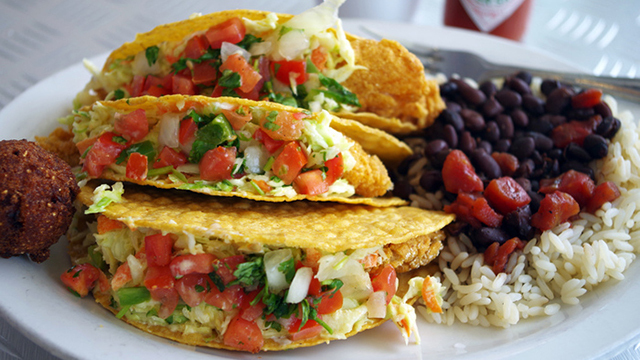 A meal of properly prepared fish tacos not only is delicious; it’s colorful as well. It titillates the eyes as well as the palate. That certainly is true, and I learned it firsthand in Mazatlán where fish tacos are as ubiquitous as beer and served everywhere from beach palapas to fancy hotels and dining establishments. Food historians will tell you, however, that fish tacos originated in the coastal communities of nearby Baja California. Modern versions emerged in the 1950s from Ensenada and San Felipe, both of which claim to be the original home of the fish taco, with street vendors cooking hot, fresh, inexpensive versions for hungry workers and market goers. You don’t have to visit Mexico to enjoy fish tacos, though. The ingredients are easy to come by regardless of where you live, and basic preparation is the same. Wrap some flaky cooked fish in a warm corn tortilla and top it with shredded veggies and some sort of sauce. Flexibility in type of fish and toppings means you can find a recipe to suit even the pickiest of guests, and letting guests assemble their own tacos means everyone will be happy – and less work for you. You can use any fish you like so long as you can flake the flesh when it is cooked. Many freshwater favorites fall into this category, including bream, crappie, catfish, walleye, perch, tilapia and bass, and popular saltwater species, too, including groupers, snappers, seatrout, halibut and flounder. The best fish tacos I’ve ever eaten were made with mahi mahi and roosterfish pulled fresh from the sapphire waters of the Pacific in Mazatlán. Deep-frying the fish is the most authentic method, but don’t limit your options. Grilled and blackened fish work great, too, especially when you use spicy seasonings in the preparation. If you use the right sauces and toppings, you also can use fish cooked by baking, broiling or even microwaving. Just remember this: For the best taste, be sure to serve the fish and tortillas piping hot, and whenever possible, use fresh veggies and made-from-scratch sauces and other toppings. Here are some recipes to get you started. 1. Mix together the cumin, salt, paprika, chili powder and garlic, and rub over the fish. 2. Heat a large skillet over medium heat. Add olive oil and heat. Add fish and cook for 2 minutes on each side or until fish flakes easily with a fork. Remove from heat. Keep warm. 3. In a medium bowl, combine avocado, mango, green and purple onion, cilantro and lime juice to make salsa. 4. Warm tortillas in a hot pan for 30 seconds on each side or until warm. Break fish into bite-sized pieces and divide evenly among tortillas. Top with 2 tablespoons of salsa on each taco. 2. Stir half of the lime juice, olive oil, chili powder, coriander, cumin, garlic, ½ teaspoon salt and the juice of one lime in small bowl until blended. Brush mixture on both sides of fish fillets. Cover and refrigerate 30 minutes. 3. Mix remaining lime juice, honey, vinegar and 1 teaspoon salt in a large bowl. Stir in coleslaw mix, jalapeño, cilantro and green onion until well blended. 4. Place the fish fillets in a grilling basket and grill 3 minutes per side or until fish flakes easily with a fork. Remove to a platter and break into chunks. 5. Grill tortillas on each side until soft with grill marks. Top each tortilla with fish and coleslaw. 1. In a small bowl, whisk together all the crema ingredients. Set aside. 2. In a large bowl, combine all the slaw ingredients. Set aside. 3. In a large bowl, mix the hot sauce and milk. Add the fish and allow to marinate 1 hour. 4. Combine the corn meal flour and lemon-pepper in a large zip-seal plastic bag, add the drained fish strips and shake to coat. 5. Pour 1 inch of cooking oil in a skillet and heat to 365 degrees. Drop fish strips in a few at a time and fry about 2 minutes each or until cooking through and flaky. Drain on paper towels. 6. Warm the tortillas. Add equal portions of fish to each, and top with desired amount of slaw and lime crema.